As you see the image above, the FE 16-35mm f/2.8 GM lens (680g) is the lightest and smallest lens compared to EF 16-35mm f/2.8L III USM lens (790g) and AF-S NIKKOR 14-24mm f/2.8 G ED lens (969g). The FE 12-24mm f/4 G Lens is much smaller and lighter than other related lenses. 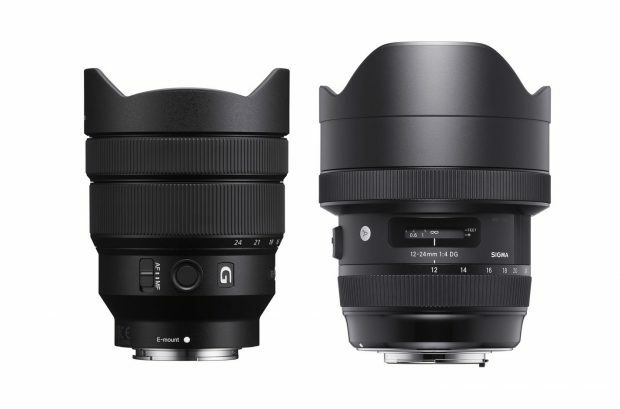 If compared to new announced Sigma 12-24mm f/4 DG HSM Art lens, FE 12-24mm f/4 G lens (565g) is only half weight than Sigma 12-24mm f/4 DG HSM Art lens (1,150g). The lens hood on the Sony 12-24 looks ridiculously undersized for such an UWA lens. While weight is good, let’s wait and see how IQ stacks up against Sigma 12-24.